Hughes Network Systems, LLC (HUGHES) announced in June 2009 that it will launch a next-generation, high throughput satellite called Jupiter 1 in the first quarter 2012 to expand its rapidly growing HughesNet broadband Internet service across North America. Designed to deliver over 100 Gbps throughput, the new Hughes satellite will utilize an enhanced version of the IPoS standard, the world's leading broadband satellite standard approved by ETSI, TIA and ITU. Employing a multi-spot beam, bent pipe Ka-band architecture, the new geostationary satellite will provide significant additional capacity for HughesNet service in North America. Its capabilities will augment the successful Spaceway 3 satellite system, the world's first with on-board switching and routing, which Hughes put into commercial service in April, 2008. Space Systems/Loral has been selected to manufacture the new Hughes satellite, based on its SSL-1300 platform, which has the proven flexibility for a broad range of applications and is expected to provide service for 15 years or more. 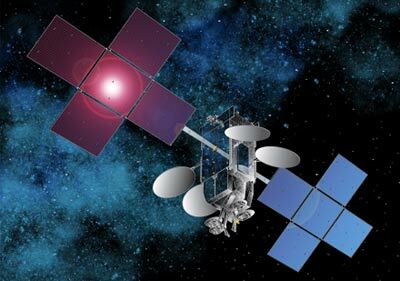 EchoStar acquired Hughes Network Systems for $1.3 billion in February 2011 and the satellite was renamed EchoStar 17.